Ferrous iron is reacted with glycine to form bis-glycinate chelate, a non-electrically charged compound that is totally nutritionally functional. 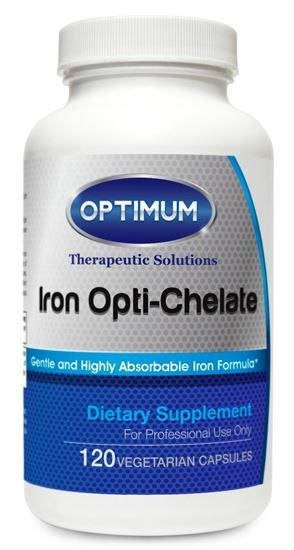 The absence of electrical charge, uncommon for an iron supplement, makes it less likely that Iron Opti-Chelate can interfere with absorption of other minerals such as calcium, vitamin E or vitamin C. Iron solubility from iron bis-glycine chelate is not affected by pH changes from 2-6. This means it travels unchanged through the stomach, into the intestine, where it is absorbed and released for transport throughout the body. Patient compliance with iron bis-glycinate appears to be better than that seen with inorganic forms of iron supplements for two reasons. First, the taste: In a study with 145 pregnant women (that concluded daily supplementation with iron bis-glycinate chelate was significantly more effective even at a lower dose than ferrous sulfate) the percentage of taste complaints among the women given ferrous sulfate was 29.8%, while 0% of the women on the bis-glycinate chelate complained about taste. Second, iron bis-glycinate is less likely to have any of the gastrointestinal side-effects associated with standard iron supplementation. A published absorption study showed there was a significant correlation between iron absorption of iron bis-glycinate chelate to serum ferritin (r = -0.60, p < 0.03) (The higher the ferritin the lower the absorption and vice versa.) The amount of iron stored in the body regulates iron bis-glycinate chelate absorption. This translates into less chance of toxicity. Another benefit of the bis-glycinate chelate form of iron over other iron supplements is that it doesn’t act as a pro-oxidant. Iron is an important component of hemoglobin, myoglobin, and ferritin. These proteins are involved in the transport, storage, and release of oxygen to the tissues. Other Ingredients: Microcrystalline cellulose, HPMC (capsule), stearic acid, magnesium stearate, and silica. Copyright © 2019 Optimum Therapeutic Solutions. All rights reserved.